Our first event of the semester will be a “Warm Welcome to the Semester” on Tuesday night, the last night before classes begin. 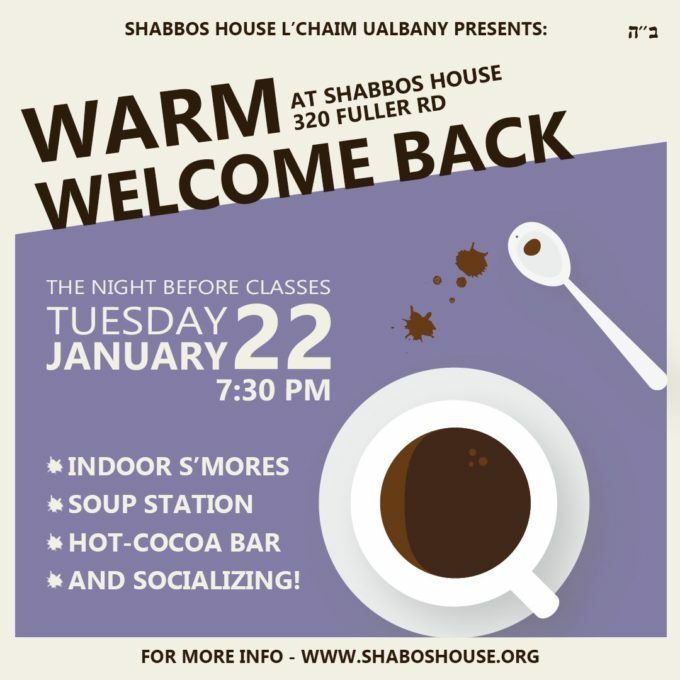 7:30pm and on at Shabbos House with a soup-bar (zucchini soup, butternut squash etc), a hot-cocoa-bar with toppings and fun, indoor s’mores and more. Yes, there will probably be a lot of snow on the ground, but it should be pretty much cleared by then. Cold out, and warm within! Come catch up with friends, socialize a bit, will be good to see students again! It will be very cold out, so if you’d like a ride over let us know.